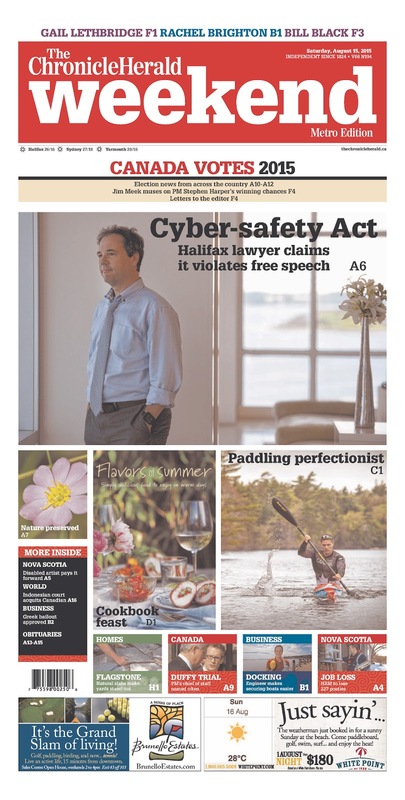 Nova Scotia's cyberbullying law declared to be unconstitutional and a "colossal failure"
The Nova Scotia Supreme Court has just released its decision in Crouch v Snell, 2015 NSCC 340 (PDF). In the decision, the Supreme Court of Nova Scotia has declared the province’s cyberbullying law to be unconstitutional, from start to finish. 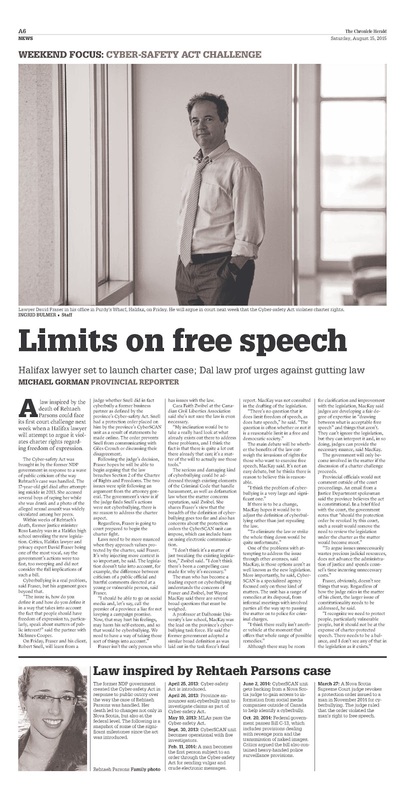 The law has been found to violate the Canadian Charter of Rights and Freedoms' guarantees of freedom of expression and “life, liberty and security of the person” rights, in a manner that cannot be upheld as a reasonable limit on those rights that can be justified in a free and democratic society. In short, the law is a dramatic failure. The case related to two adults, former business partners, who had a falling out. Mr. Crouch sought and obtained an ex parte cybersafety protection order before a justice of the peace in December 2014. The respondent (I was his counsel) challenged the order and the legislation. I have not been known as a fan of the Cyber-safety Act. I've blogged about it, written Op-Eds about it and I've called it a dumpster fire. It was passed unanimously by the Nova Scotia legislature in the immediate aftermath of the tragic death of Rehtaeh Parsons. In my view, it was created in haste in the immediate, emotional aftermath of the tragic death of a young woman who had been sexually assaulted and had photos of the assault circulated around the community. The government of the day -- which was heading for an election -- was not willing to throw the police and the prosecution service under the bus for no charges being laid, so instead created the appearance of doing something by creating and passing a very poorly executed law. In the process, they trampled on the Charter rights of all Nova Scotians and created a distraction from the important discussion about sexual assault and consent. Among other things, the Act allows an alleged victim of cyberbullying to appear before a justice of the peace to obtain a cybersafety protection order. These orders can go so far as to result in the confiscation of electronic devices and being barred from using the internet. An alleged cyberbully never has any notice of this hearing and has no right to give his side before the order is made. In this case, the order of the justice of the peace even ordered the respondent to delete all of his social media postings that didn’t refer to anyone in particular, as they may have referred to the complainant. A neighbour who calls to warn that smoke is coming from your upstairs windows causes fear. A lawyer who sends a demand letter by fax or e-mail causes intimidation. I expect Bob Dylan caused humiliation to P.F. Sloan when he released "Positively 4th Street", just as a local on-line newspaper causes humiliation when it reports that someone has been charged with a vile offence. Each is a cyberbully, according to the literal meaning of the definitions, no matter the good intentions of the neighbour, the just demand of the lawyer, or the truthfulness of Mr. Dylan or the newspaper. In conclusion, I find that the Act has both the purpose and effect of controlling or restricting freedom of expression. In this regard, I find that the Act provides no intelligible standard according to which Justices of the Peace and the judiciary must do their work. It does not provide sufficiently clear standards to avoid arbitrary and discriminatory applications. The Legislature has given a plenary discretion to do whatever seems best in a wide set of circumstances. There is no "limit prescribed by law" and the impugned provisions of the Act cannot be justified under s. 1. In the event I am wrong, I will perform the balance of the Oakes analysis. ... Section 5(1) must be read as requiring protection order applications to be made without notice to the respondent. I also agree with the Respondent's submission that even if s. 5(1) did give applicants a choice in the matter, it would be a rare case indeed where an applicant would choose to give notice. Finally, with respect to the Attorney General's reliance on the various procedural safeguards set out in the Act, the reality is that while the respondent waits for the opportunity to be heard at a de novo hearing, his or her Charter-protected rights and freedoms will continue to be infringed upon. This will be on the basis of a proceeding that most likely occurred without notice to the respondent, and without the respondent having had an opportunity to be heard. I find the process set out in s. 5(1) of the Act is not rationally connected to the legislative objectives. The process does not specifically address a targeted mischief. The next thing to note is the absence of conditions or qualifications ordinarily part of the meaning of bullying. Truth does not appear to matter. Motive does not appear to matter. Repetition or continuation might ("repeated or with continuing effect") or might not ("typically") matter. In conclusion, the Cyber-safety Act fails the "minimum impairment" branch of the Oakes test. Respondent says this Court must instead balance an individual's right to express any sort of speech captured in the definition of "cyberbullying" against the objectives of the Act. The Respondent says the Act prevents an individual from telling the truth if it hurts another person's feelings or harms their self-esteem, and it does not provide any defences. The Act does not accommodate expression that relates to individual self-fulfillment, truth-finding or political discourse. The Respondent submits that the Act can therefore "limit speech that cuts to the core of Charter values". The Respondent distinguishes Lucas on the basis that the libel provisions in the Criminal Code were upheld because they prohibit only falsehoods that are known by the defendant to be false. It is clear that many types of expression that go to the core of freedom of expression values might be caught in the definition of cyberbullying. These deleterious effects have not been outweighed by the presumed salutary effects. In the end, the Court found that the Cyber-safety Act offends sections 2(b) and 7 of the Charter and cannot be justified. Both parties confined their submissions to the definition of cyberbullying and Part I of the Act. I have identified a number of problems with both components. The remaining parts of the Act cannot survive on their own. They are inextricably connected to the offending provisions, in particular the definition of cyberbullying. Severance would not be appropriate. The Act being over-inclusive rather than underinclusive, reading in also would not be an appropriate remedy. I have already explained why reading in a requirement for malice is not, in my view, appropriate or sufficient. The Act must be struck down in its entirety. The Attorney General has not persuaded me that a temporary suspension is warranted. To temporarily suspend the declaration of validity would be to condone further infringements of Charter protected rights and freedoms. Further, the fact that the Act was enacted to fill a "gap" in the legislation does not mean that victims of cyberbullying will be completely without redress in the time it takes to enact new cyberbullying legislation. They will have the usual albeit imperfect civil and criminal avenues available to them. So far, the government of Nova Scotia has not commented on the case and it remains to be seen whether they will appeal the case or go back to the drawing board, or both. If they do go back to the drawing board, I really hope they will do it with very careful deliberation and full consultation with experts. But if nothing else, they have a good example of how not to do it. The European Court of Justice has just declared that the European-American Safe Harbour framework to be invalid. The Safe Harbour Framework was a compromise solution to address the prohibition against transfers of European personal information to any jurisdiction without "adequate" privacy protections. The American government and the European Union arrived at a voluntary, opt-in framework by which US companies could submit to a form of regulation that would be considered adequate for European standards. Following a complaint by an Austrian Facebook user, the court essentially determined that -- in light of the Snowden revelations -- that personal data in the US is not afforded adequate protection. The decision is here: Maximillian Schrems v Data Protection Commissioner. The Data Protection Directive1 provides that the transfer of personal data to a third country may, in principle, take place only if that third country ensures an adequate level of protection of the data. The directive also provides that the Commission may find that a third country ensures an adequate level of protection by reason of its domestic law or its international commitments. Finally, the directive provides that each Member State is to designate one or more public authorities responsible for monitoring the application within its territory of the national provisions adopted on the basis of the directive (‘national supervisory authorities’). Maximillian Schrems, an Austrian citizen, has been a Facebook user since 2008. As is the case with other subscribers residing in the EU, some or all of the data provided by Mr Schrems to Facebook is transferred from Facebook’s Irish subsidiary to servers located in the United States, where it is processed. Mr Schrems lodged a complaint with the Irish supervisory authority (the Data Protection Commissioner), taking the view that, in the light of the revelations made in 2013 by Edward Snowden concerning the activities of the United States intelligence services (in particular the National Security Agency (‘the NSA’)), the law and practice of the United States do not offer sufficient protection against surveillance by the public authorities of the data transferred to that country. The Irish authority rejected the complaint, on the ground, in particular, that in a decision of 26 July 20002 the Commission considered that, under the ‘safe harbour’ scheme,3 the United States ensures an adequate level of protection of the personal data transferred (the Safe Harbour Decision). In today’s judgment, the Court of Justice holds that the existence of a Commission decision finding that a third country ensures an adequate level of protection of the personal data transferred cannot eliminate or even reduce the powers available to the national supervisory authorities under the Charter of Fundamental Rights of the European Union and the directive. The Court stresses in this regard the right, guaranteed by the Charter, to the protection of personal data and the task with which the national supervisory authorities are entrusted under the Charter. The Court considers that that analysis of the scheme is borne out by two Commission communications,4 according to which the United States authorities were able to access the personal data transferred from the Member States to the United States and process it in a way incompatible, in particular, with the purposes for which it was transferred, beyond what was strictly necessary and proportionate to the protection of national security. Also, the Commission noted that the persons concerned had no administrative or judicial means of redress enabling, in particular, the data relating to them to be accessed and, as the case may be, rectified or erased. communications must be regarded as compromising the essence of the fundamental right to respect for private life. In a decision issued on July 27, 2015 but not yet published (but available here as a PDF), the Federal Court of Canada has certified a class action against the Government of Canada for disclosing the personal health information of participants in the "Marihuana Medical Access Program" in a botched mailout that was intended to advise program participants about changes to the regulation, which ironically where said to protect privacy and safety. In November 2013, Health Canada sent notices to over 40,000 participants of the Marihuana Medical Access Program (MMAP) to advise of changes to regulations governing the use of medical marijuana in Canada. The notices were delivered in oversized envelopes that had the words “Health Canada - Marihuana Medical Access Program” on the return address, revealing to anyone who saw the envelope that the recipient was licensed to possess or produce medical marihuana for medical purposes. Previously, Health Canada’s mailings to MMAP members were discreet and made no mention of marijuana on the envelopes. Despite the Government of Canada’s acknowledgement of the error and that it was outside their normal practice, its reaction has consistently been "no harm, no foul". What's most notable about this decision -- which is consistent with the recent decision in Condon v. Canada -- is that the court certified the plaintiffs' claim under the novel tort of "public disclosure of private facts". This tort is recognized in the United States, but is untested in Canada. It is a part of the four different privacy torts recognized by the Ontario Court of Appeal in Jones v. Tsige. In March 2015, the Privacy Commissioner of Canada found that Health Canada's breach was a violation of the Privacy Act. At the certification hearing, the Government of Canada argued that the Privacy Commissioner's finding should be enough to satisfy everyone harmed by the breach, but the Court noted that the Commissioner can't award any of the damages sought by the plaintiffs. Full disclosure: My firm is one of the firms representing the plaintiffs. The Federal Court of Canada has certified a class action commenced on behalf of more than 40,000 medical marijuana licensees alleging that Health Canada violated their privacy. In November 2013, Health Canada sent notices to over 40,000 participants of the Marihuana Medical Access Program (MMAP) to advise of changes to regulations governing the use of medical marijuana in Canada. The notices were delivered in oversized envelopes that had the words “Health Canada - Marihuana Medical Access Program” on the return address, revealing to anyone who saw the envelope that the recipient was licensed to possess or produce medical marihuana for medical purposes. Previously, Health Canada’s mailings to MMAP members were discreet and made no mention of marijuana on the envelopes. Despite the Government of Canada’s acknowledgement of the error, it insists that no one was harmed by the breach. In March 2015, the Office of the Privacy Commissioner of Canada concluded that Health Canada violated federal privacy laws. However, in the recent certification decision, the Court found that the class action is necessary to provide access to justice because the Privacy Commissioner cannot order the Government of Canada to compensate class members harmed by the breach. The Government has 30 days to appeal the certification decision. McInnes Cooper, Branch MacMaster LLP, Charney Lawyers, and Sutts Strosberg LLP are jointly representing the plaintiffs in the medical marijuana privacy breach class action filed in the Federal Court against the Government of Canada. The plaintiffs seek damages for breach of contract, breach of confidence, invasion of privacy and Charter violations. “This is not over yet, but the thousands of affected program members should take some comfort that every legal claim we advanced on their behalf has been approved to go forward,” said David Fraser of McInnes Cooper. “As citizens of this great country, we rely on our government to protect our sensitive personal information from being disclosed and to protect our privacy during all communications. This decision sends a clear message to the government that our Courts consider privacy to be of the utmost importance and expect our government to take its privacy obligations seriously or face the consequences,” said Ted Charney of Charney Lawyers. “Over one thousand people have registered on our secure website to tell us how the breach affected them. We will continue to pursue justice for those harmed by the breach,” said David Robins of Sutts, Strosberg LLP. While it is not necessary to “opt in” to participate in the class action, class members are urged to visit the www.marijuanaclassaction.com website to obtain updates and to register because the information collected on the secured site will assist class counsel in communicating with class members and moving the case forward. Those who have already registered do not need to re-register but should update their information if their circumstances change or to report further harm suffered from the breach. McInnes Cooper is among the top business and litigation law firms in Canada, with more than 200 lawyers in seven Canadian offices, serving clients across North America and abroad. The firm is a market leader in energy and natural resources, business, litigation, employment, tax, real estate and insurance law. McInnes Cooper is the exclusive member firm in Newfoundland, New Brunswick, Nova Scotia and Prince Edward Island for Lex Mundi – the world’s leading network of independent law firms with in-depth experience in 100+ countries worldwide. For more background, check out these previous posts. The Supreme Court of Canada has granted leave to appeal from the Ontario Court of Appeal decision in Royal Bank of Canada v. Trang, 2014 ONCA 883. This is and will be an important decision about how to deal with certain provisions of the federal privacy law that have an impact on lenders. On December 9, 2014, the Ontario Court of Appeal decided that the Personal Information Protection and Electronic Documents Act (PIPEDA) prevents a mortgagee from disclosing the mortgagor’s discharge statement to another lender – even when that lender has a judgement against the mortgagor – without either the mortgagor’s express consent or a specific court order. The decision is relevant beyond Ontario because PIPEDA is federal legislation applicable across Canada, and Atlantic Canadian Provinces have legislation analogous to the Ontario legislation. Scotiabank held a registered first mortgage on the Trang’s Toronto real property. RBC subsequently loaned the Trangs money. They defaulted and RBC obtained a judgment against them. Twice, the Trangs did not appear for their examination in aid of execution. RBC asked Scotiabank for a mortgage discharge statement to facilitate sale of the property. Scotiabank said PIPEDA precludes it from disclosing the statement without the Trangs’ consent. RBC asked the Ontario court for an order compelling Scotiabank to produce the mortgage discharge statement – but a split five-judge panel of the Ontario Court of Appeal refused. The Court did note that RBC could use the usual procedural tools to examine a representative of Scotiabank, though it is unclear to me whether that would result in the discharge statement. The majority of the Court found that a mortgage discharge statement is personal information, and there was no implied consent on the part of the borrowers to have it disclosed in the circumstances. It'll be interesting to see where the Supreme Court of Canada falls on this issue. The Federal Court of Appeal in Condon v Canada, 2015 FCA 159 (not yet available on CanLII but here as a Google Drive PDF), has reversed a lower court decision to not certify claims of negligence and breach of confidence in the class action lawsuit that followed the Federal Government's loss of a hard drive containing personal information about 583,000 Canada Student Loan recipients. The plaintiffs, in Condon v Canada, 2014 FC 250, sought certification under a number of causes of action, including breach of contract, intrusion upon seclusion (invasion of privacy), negligence and breach of confidence. Breach of contract and intrusion upon seclusion do not require damages for an individual to recover, and both of these causes of action were certified. Those that do require damages to succeed, negligence and breach of confidence, were not successful at the certification motion. As stated by the Supreme Court, the determination of whether the pleadings disclose a reasonable cause of action is to be based on the assumption that the facts as pleaded are true. This would mean that evidence is not to be submitted at the hearing of the motion. Otherwise, the hearing of the motion could turn into a full hearing on the merits. 68 In addition, a summary review of the evidence adduced by both parties leads the Court to the conclusion that the Plaintiffs have not suffered any compensable damages. The Plaintiffs have not been victims of fraud or identity theft, they have spent at most some four hours over the phone seeking status updates from the Minister, they have not availed themselves of any credit monitoring services offered by the credit reporting agencies nor have they availed themselves of the Credit Flag service offered by the Defendant. 69 Nor does the evidence adduced support a claim for increased risk of identity theft in the future. Since the Data Loss, Equifax has produced reports pertaining to the credit files of the 88,548 individuals who availed themselves of the Credit Flag service. These reports show that there had been no increase in the relevant indicia that would be consistent with an increase in criminal activities involving those individuals' Personal Information. The rate of criminal activities registered was not higher than the 3% of the population generally victim of identity theft. Moreover, the Plaintiffs submitted a CBC news article concerning a Class Member who had been a victim of identity theft yet the article noted no proven causal link between the Data Loss and that theft. It appears that the Federal Court Judge evaluated the evidence in concluding that the Appellants had not suffered any “compensable damages”. The determination of whether the Appellants had a reasonable cause of action in negligence or breach of confidence should have been made based on the facts as pled, not on the evidence adduced in support of the motion. Reading the Consolidated Statement of Claim with this principle in mind, the Appellants have claimed that they have suffered damages and they have identified the nature of the damages that they are claiming. In particular, the Appellants have claimed special damages for “costs incurred in preventing identity theft” and “out-of-pocket expenses” and, as noted above, it is to be assumed that these costs have been incurred. As a result there was no basis to not include the claims for negligence and breach of confidence as part of the class proceeding. The Federal Court of Appeal has sent the matter back to the trial level for determination, including the claims for negligence and breach of confidence and to determine the common questions in the class proceeding in relation to those claims. PrivaSecTech is hosting an AMA (“ Ask me anything “) on Reddit which will feature some of Canada’s top privacy professionals. On Friday May 1st from 17:00 - 20:00 AT / 15:00-19:00 ET / 12:00-16:00 PT, the team will be on hand to answer all of your privacy-related questions. Bring all of your interesting legal, policy, and technical questions as they apply to your organization or to yourself as a Canadian. Micheal Vonn – The BCCLA’s own Policy Director, a specialist in privacy, national security, policing, surveillance and free speech. Andrew Clement – Professor in the faculty of Information, University of Toronto researching surveillance and privacy. He leads the IXmaps.ca internet surveillance mapping project and recently initiated the Snowden Surveillance Archive . John Wunderlich – Independent privacy consultant and researcher. You can follow him on Twitter @PrivacyCDN or find him at www.wunderlich.ca . Sara Levine – A specialist in privacy, freedom of information and health law, serving clients in the business, regulatory, non-profit, education and health sectors. Sara is committed to public education around privacy and freedom of information issues, and regularly speaks to groups interested in privacy rights and obligations in BC. David T.S. Fraser – A Canadian privacy lawyer and partner with the firm of McInnes Cooper . He has a national and international practice advising corporations and individuals on matters related to Canadian privacy laws. You will need an account on Reddit to participate. On the afternoon of May 1st, join the Canadian Privacy iAMA thread, and ask your question(s)! Visit PrivaSecTech’s event page for the link to the Reddit iAMA, which will be posted as soon as it is active! In the interim, check out r/privacy and newly formed r/privacylaw .